When this post goes live, I will be in China. I can't tell you how it's going because, well, I'm not really there yet! However, I thought I would still keep my blog updating and so thought I'd share with you the toiletries I took with me baring in mind I could only take hand luggage so had to deal with restrictions. This might be useful or anyone wanting to pack light or to just take hand luggage. I keep this a simple as I can by decanting my favourite shampoo at the moment which is the Elvive Nutri-gloss shampoo for oily prone hair. I feel this gives my hair a little extra time before it goes greasy. Conditioner, I'm not fussy with and so I just picked up the Pantene Prov Conditioner for Sleek & Straight hair; I've used this in the past and it's done the job. The John Freda Frizz Ease Serum has become a staple in my hair care for over a year now and I really do think it's helped tame fly aways and baby hairs and last year in the humid weather on holiday, it helped it from going out of control and turning into Monica in Barbados(see reference photo here) and I think it will come in pretty handy in China. You only need a few pumps each time you wash your hair so pumping some into a small pot should be enough to last me. The only other thing I'll be taking is a mini Batiste Dry Shampoo; it's the only dry shampoo I ever use and will be great for those in between wash days and when it just needs a freshen. With my tangle teezer, hair band, bobbles and a few bobby pins that's all! This is where I admit that I have no intention in taking make up remover in the form of micellar water or oil like I'm sure we'd all prefer and my skin would probably too but, due to the restrictions, I think I can last for ten days with make up removing wipes and so I opted for the Yes To Cucumber Wipes which I've used once before and found them to be really soothing and not harsh on my skin so I think they'll be great and, being in a pack of ten, it's the perfect size to take with me. For cleanser, I have decided to take another new favourite which is the Simple Spotless Skin Triple Action Face Wash which has been really nice on my skin and so I've put some into a liquid bottle to take with me. Especially when I'm abroad, my skin tends to dry and so moisturiser is crucial so I'm definitely taking my Garnier Moisture Nourish for normal to dry skin. This perfect for under the make up as well as night if it's not too dry. Then I'm going to take, if I have enough room, the Garnier Moisture Soft for dry to very dry skin in case of crisis and then encase of a huge dry crisis a small pot of my Origins Overnight Hydrating Mask. Lastly for skin care is a sun cream. I don't believe you really have to have a seperate sun cream for your face and your body and so I picked up the Nivea factor 50. I proabably don't need 50 but better be safe than sorry. To go a long with that I will be taking a small pot of my favourite after sun treatment which is the Banana Boat Aloe Vera Gel which is perfect and, if we have a mini fridge, it will be living there in case of super burn emergencies to cool me down. Toothbrush and tooth paste is a given. I'm taking two small 20ml tubes that'll be enough to last me. I've also decide to take a Soap & Glory Body Butter as a little skin treat that I, fortunately have enough room to pack. For Deodrant, I've picked up the Sure Maximum Protection Deodorant which is great for a hot climate and I think will be great if the planes grows stuffy over the 18 hours I'm on them for. I was freaking out when I realised we can only take hand luggage as I thought razors wouldn't be allowed and so panicked and thought I wouldn't be able to shave my armpits for 10 days. But I did my research and, thankfully you can so I picked up the Venus Snap Razor which is prefect for travelling especially with the cute blue case it comes with. Something that will be told will be a God send in China and,for me, anywhere is hand sanitizer- something to always have handy when travelling aswell as just normal wipes- they're life savers. Apart from make up and other medication, that's all my toiletries and I'm under the limit! If you're travelling soon, I hope this has helped those of you trying to streamline your luggage. 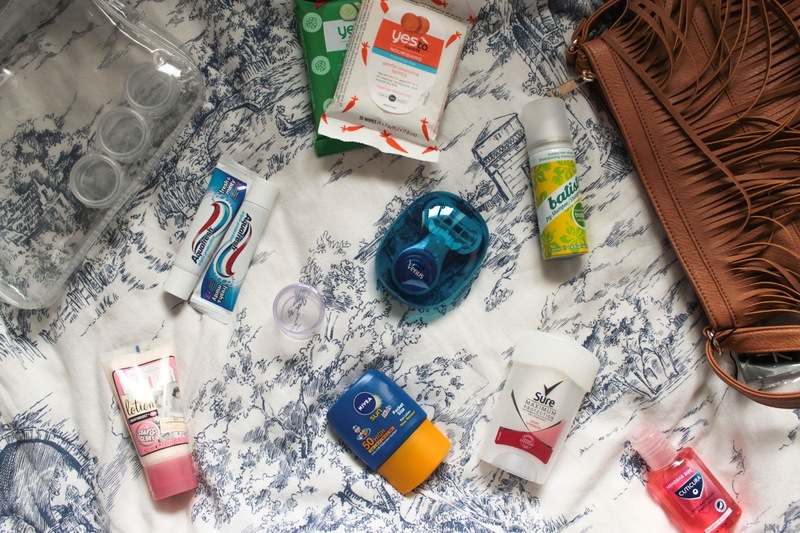 What are your toiletry essentials for travelling?